But I’m completely fine with it. 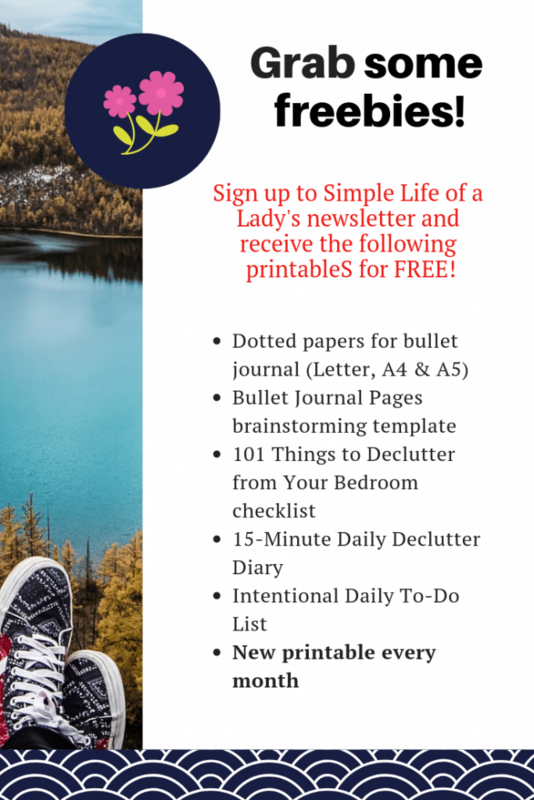 As far as organization and productivity are concerned, I can pretty much say that bullet journaling has helped me a lot to organize my thoughts and get things done. But I must admit, I like seeing beautiful designs. Not to mention the fact that it is because of these creatives that I started my own BuJo. 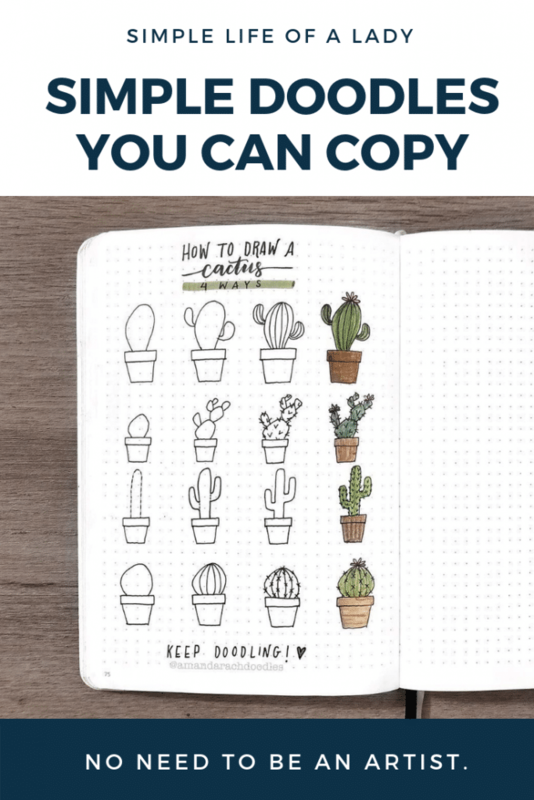 Thankfully, there are lots of doodles that can easily be copied. 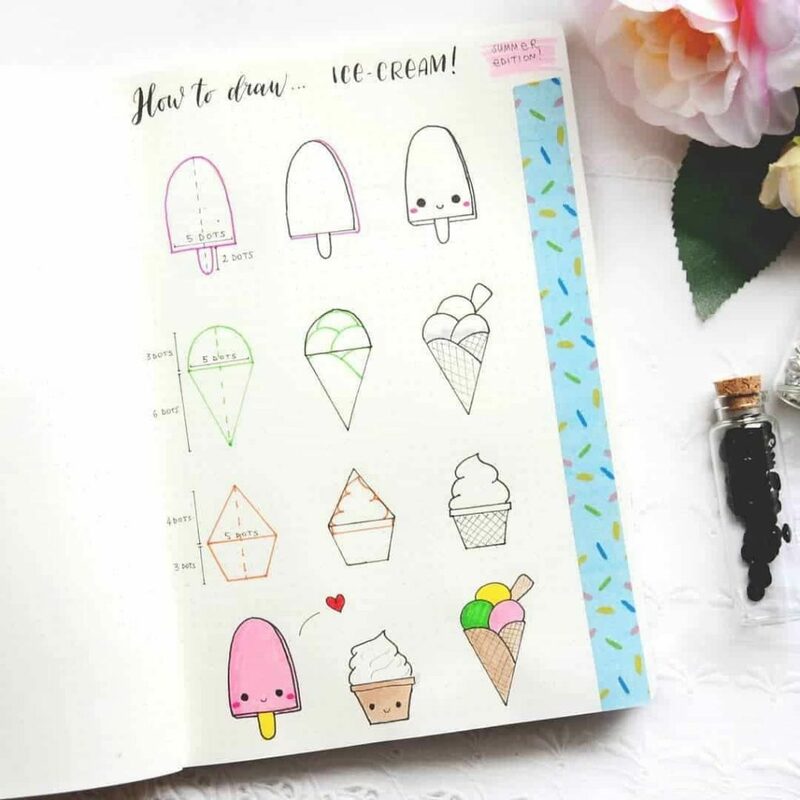 These may not be as intricate or artistic as some of the BuJo designs that you may find on Pinterest and Instagram. 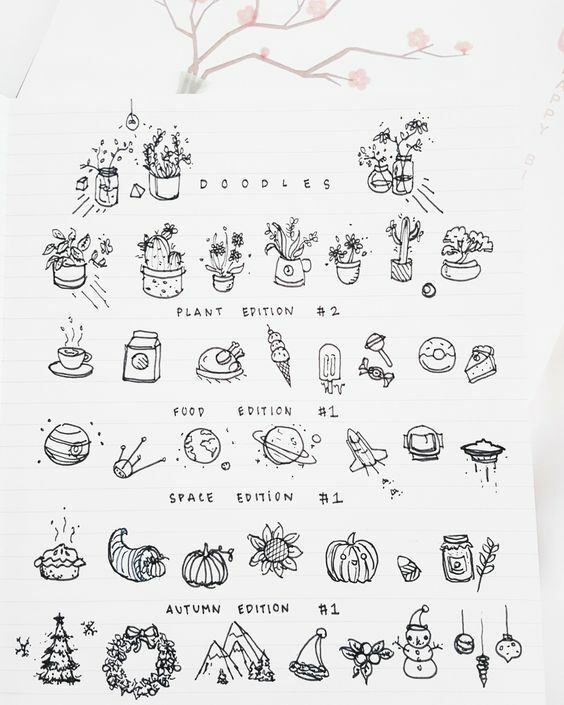 But for someone like me, who doesn’t have much artistic abilities, these are enough to satisfy my need for designing my bullet journal, and of course, to make things fun! 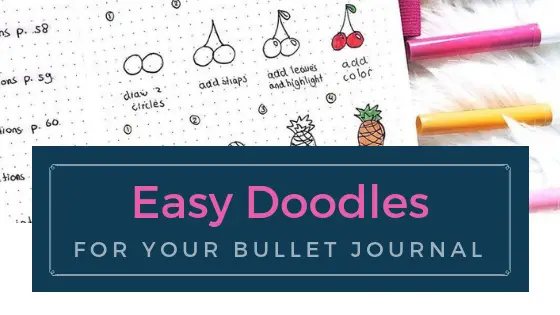 I’m very glad and thankful that many bullet journalists share their doodles online, along with the tutorials so that anyone can do them too. 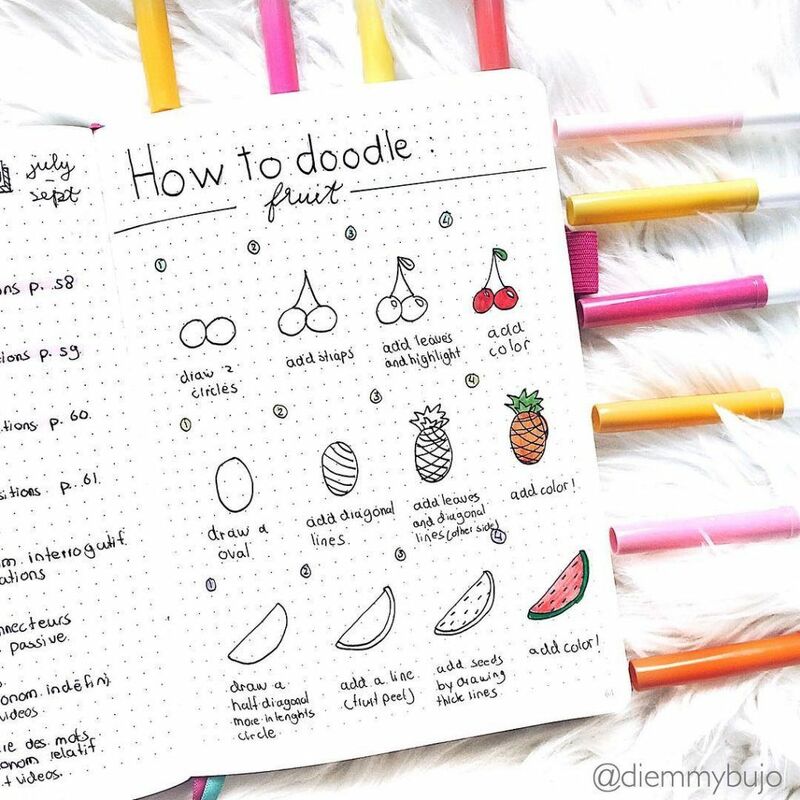 Here are the pictures of the doodles that I love to copy! If you find something that you like, PIN it and copy it later in your own BuJo. 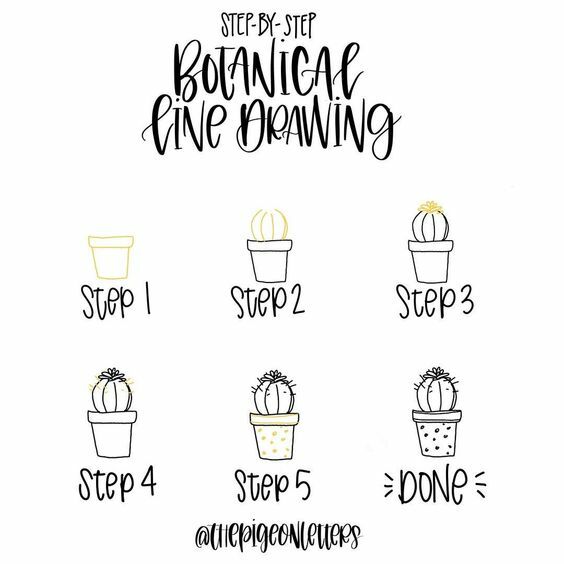 These are random designs, but… three steps only… and you already have a drawing! Pineapple… strawberry… watermelon and blueberry. My favorite fruit to eat in this collection is watermelon. Didn’t know this is also the easiest to draw! I’m biased with the watermelon. But I can say that the cherry is easy to draw too. My brother brought a cactus at home many years ago. No one took care of it. So you can guess what happened. When I saw these doodles, it made me feel somewhat guilty. Perhaps if I took time to take care of it then, it wouldn’t have died. 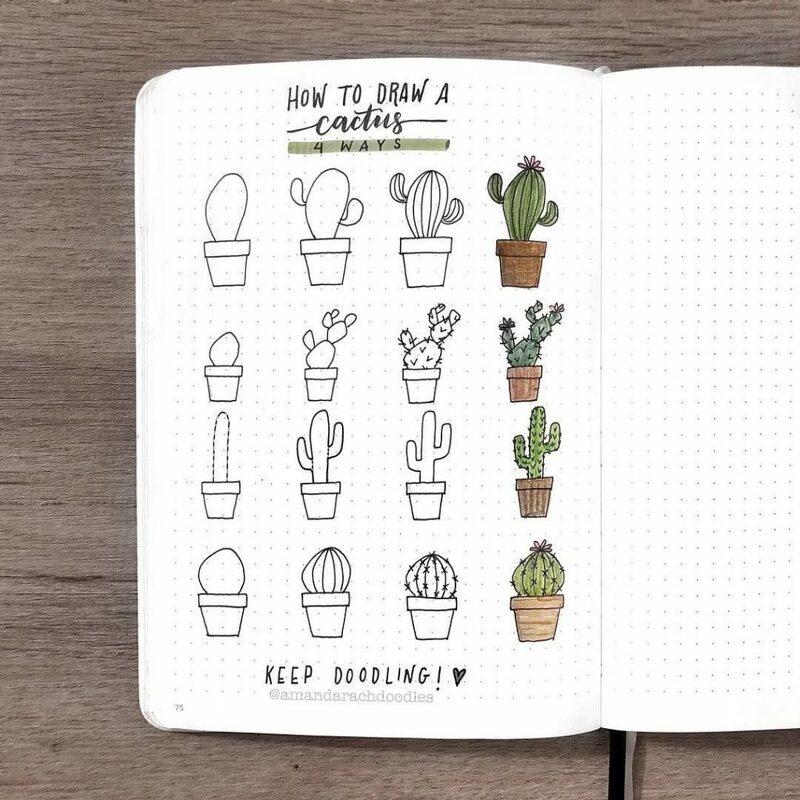 Well anyway, if I can’t take care of a cactus in real life, maybe that’s because it has somewhere else to grow – in my bullet journal. I love eating ice cream! I must have gotten it from my Dad. Our favorite flavors are chocolate marble, double dutch, rocky road, and chocolate and vanilla combined. I remember my Dad tried to make an avocado flavored ice cream when I was still a kid. It was very delicious! And it was quite an experience. When we took it out of the freezer, it was very frozen. Like ice frozen, as hard as a rock. We tried scooping it out but every time we did, the spoon bent. Couldn’t handle the pressure I guess. If I remember it correctly, we had to wait for almost an hour before we could finally scoop it out of the container. I guess it had something to do with the texture. Well, it was homemade and it was an experiment. Add the fact that there was no internet yet at that time. So you couldn’t google how to make avocado ice cream. But again I was still a kid. I didn’t care about the texture. All I wanted was the yummy ice cream and the fun. And I had both! Rose is among the favorite flowers of many women. It’s what your man may give you on special occasions. And it’s a beautiful decoration. When I see a drawing of this flower, I know how difficult it must be to draw one. But with this doodle tutorial, maybe it won’t be as hard as I thought. Here’s another that I think is even easier. This is probably one of those that I thought I would never take interest to draw. 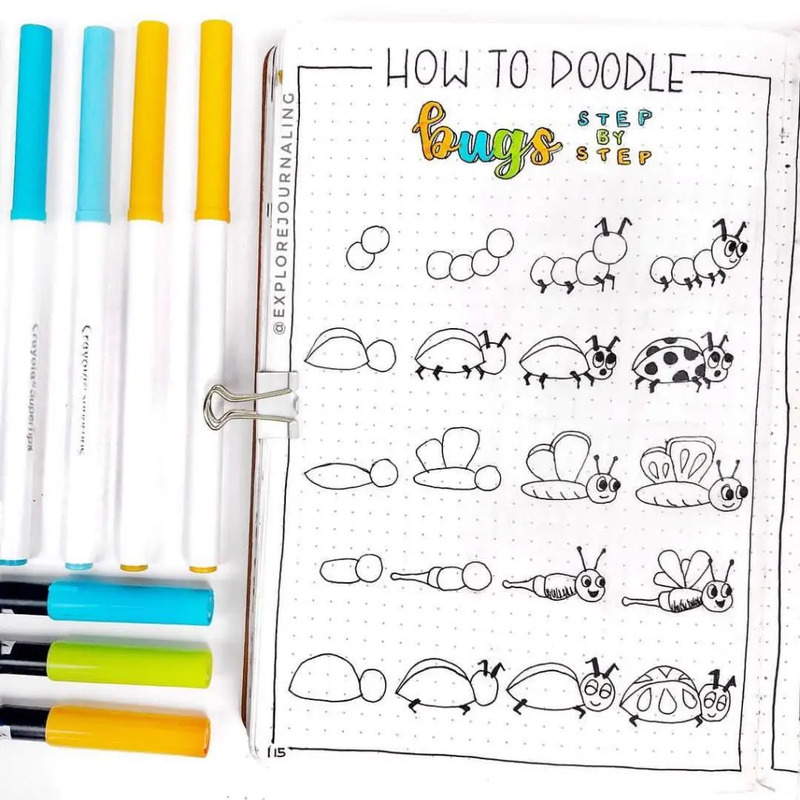 Looks like I’m wrong again because here I am and I’m so awed by how cute these bugs can be on BuJo! When I look at these drawings, I can’t help but smile. 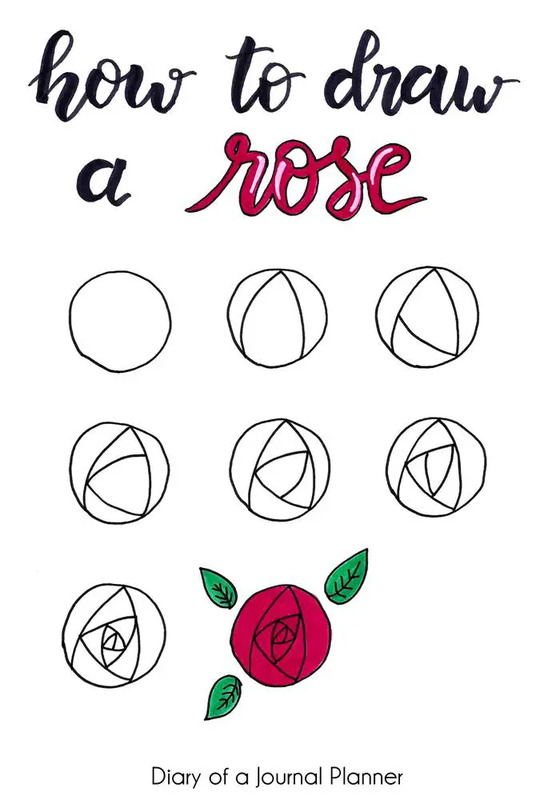 This is actually just a step in drawing wreaths, and the combinations do make beautiful wreaths. However, you can also have them as stand-alone designs. 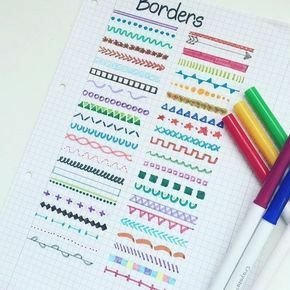 I personally think that they can be great borders for your pages. 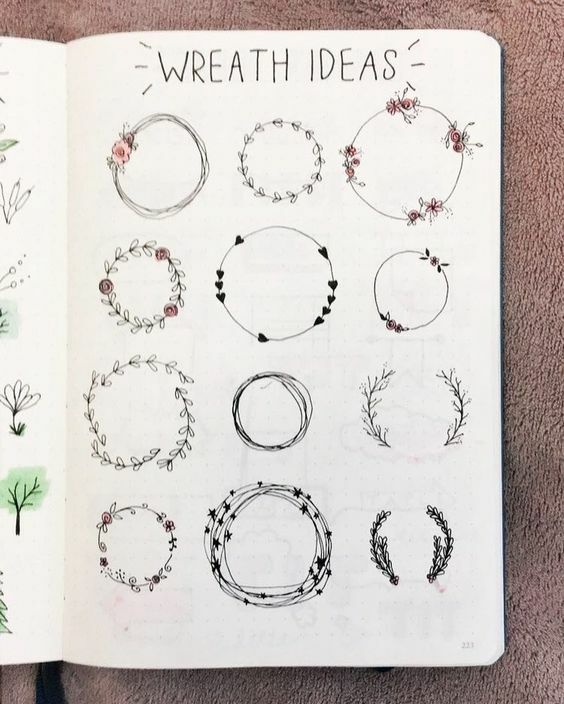 I picked this collection of wreaths because they look really simple. So it doesn’t feel overwhelming to start. It really helps if you have a pattern to draw the circle so you can get an accurate shape. 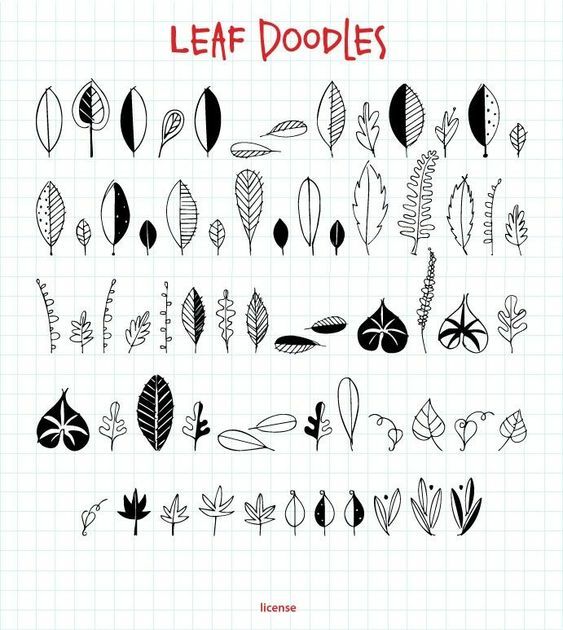 If you love nature, you’re going to enjoy these different leaf designs. 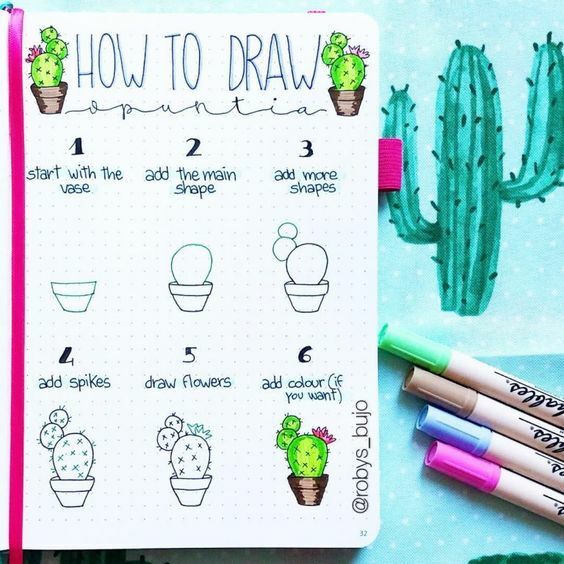 Combine these leaves, add a couple of flowers and you have a plant theme for your BuJo. I found the cup and the pizza to be the easiest to draw in this collection. But it is the hot dog stand that made me enjoy the most. I’m not good at drawing curves so I found it a little challenging to doodle the hotdog and pretzel. Simple yet stylish. Beautiful and classic. That’s how I find these snowflakes. These also remind me of the Disney movie Frozen. I’ve watched it several times already but I still enjoy it a lot! 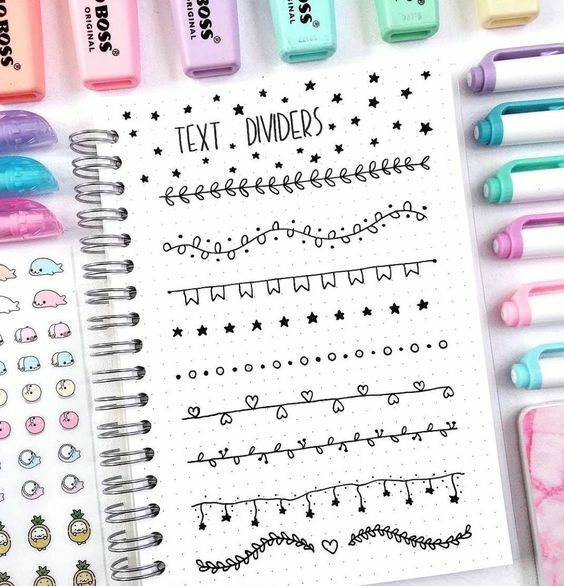 And these snowflakes seem like stars to me – simple designs that can brighten not only your BuJo, but your day as well! 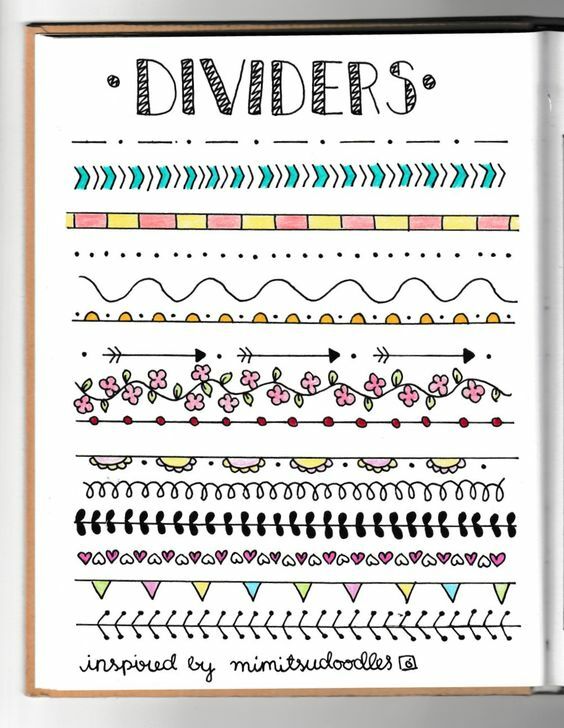 I know you can make all those previous designs as dividers. 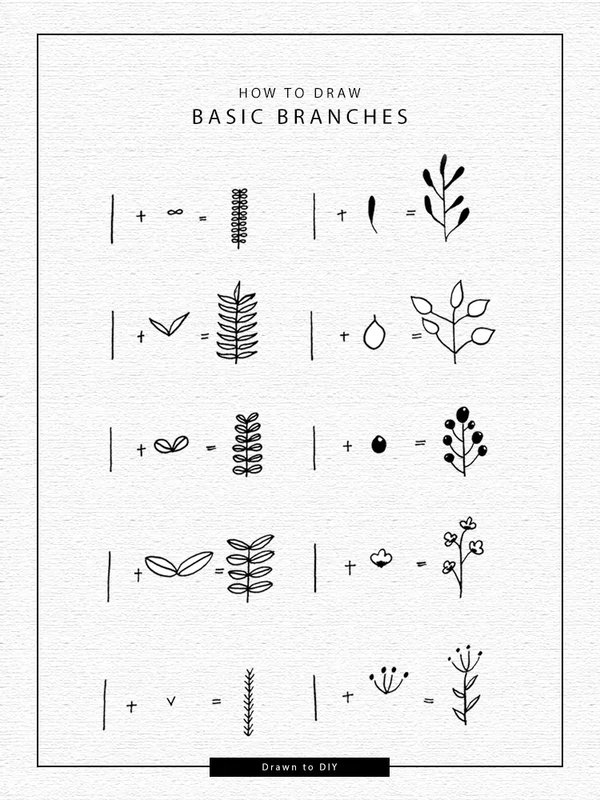 But if you want something even simpler, you’ve got lots of options here! These won’t take much time to draw because basically, they’re just a series of lines and points. Whenever you’re in a rush and you need a divider real quick, my best advice is just draw a horizontal line. Then you can design that later, when you’re not in a hurry anymore. Do you make the banner first before you put in the title of the page? My pages are all titled, but there are no banners. 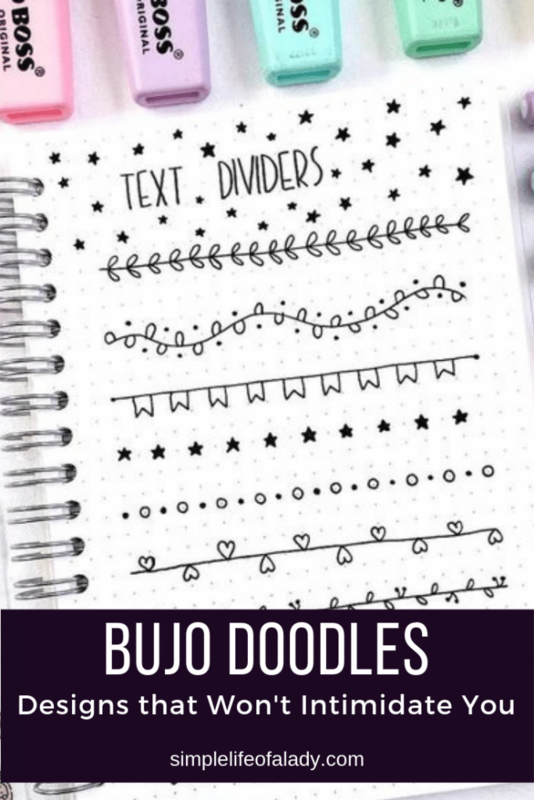 So if you have titles all over your BuJo already, and you’re thinking they will look good with banners, there’s nothing to worry about. Just doodle the banners around the titles. 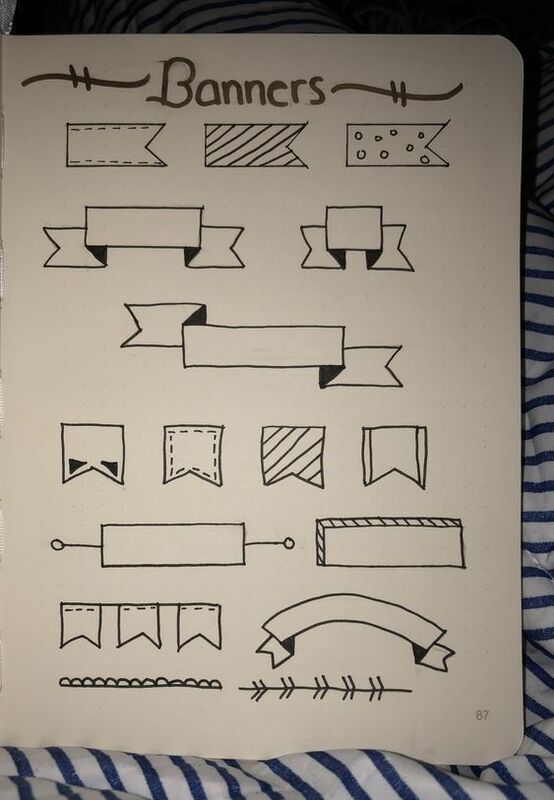 As for me, I am yet to decide whether I would doodle banners because my BuJo titles look pretty much good to me already. But well, that’s me. You, on the other hand might be thinking of more banner options to add in you BuJo. I hope you have great ones, no matter how busy or crazy the days are. 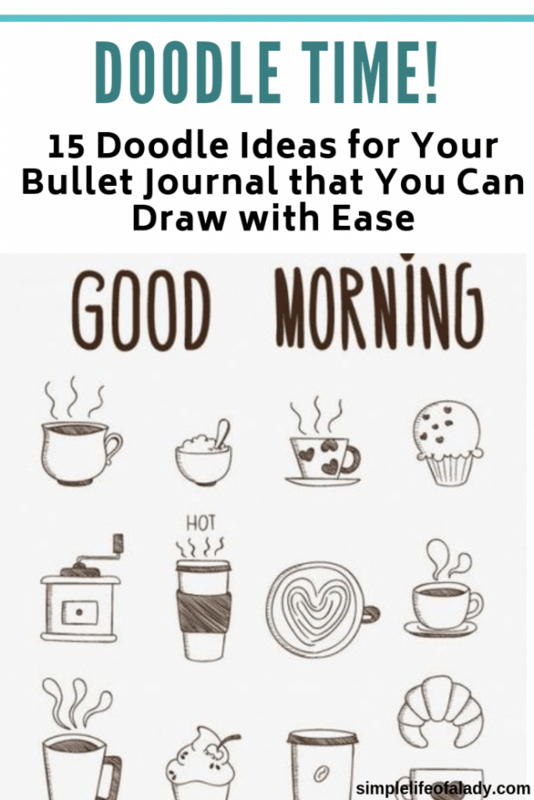 To brighten up your morning, here are some mornings doodles you can add to you bullet journal. 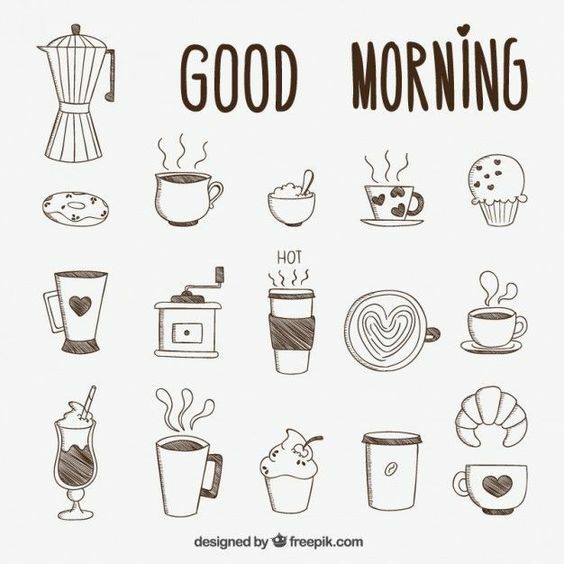 My hubby loves to drink coffee in the morning. 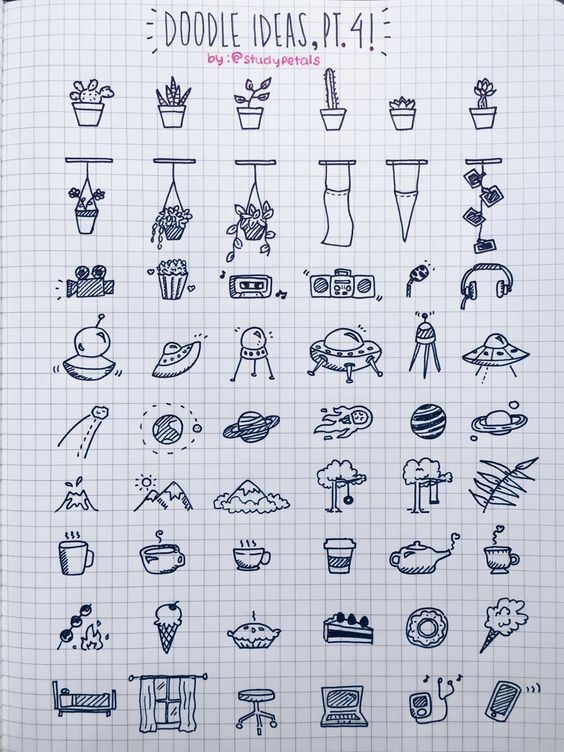 So you can guess what attracted me to these doodles. Not that every hot drink here is coffee. It can be anything. It’s just me assuming it’s coffee. 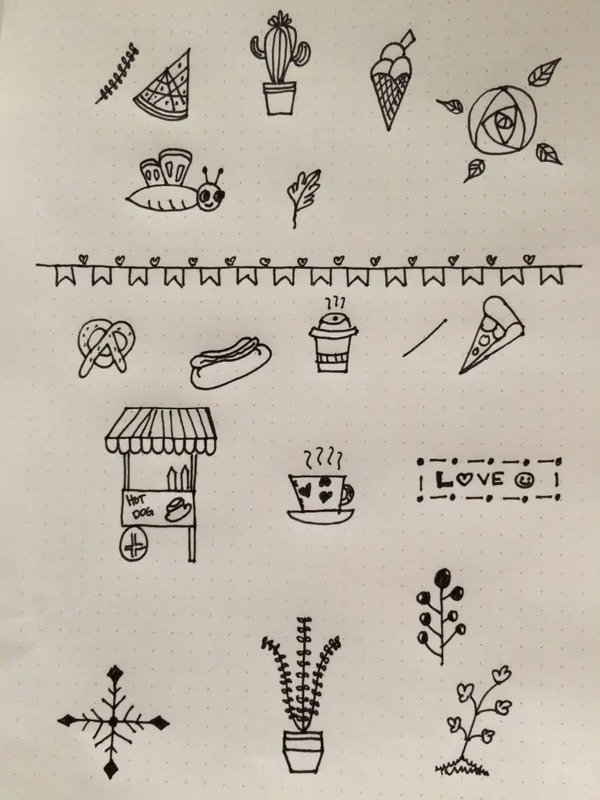 Here are more doodles to copy. Draw whatever piques your interest. Here’s the page where I copied some of these doodles. I told you before, I’m not an artist. 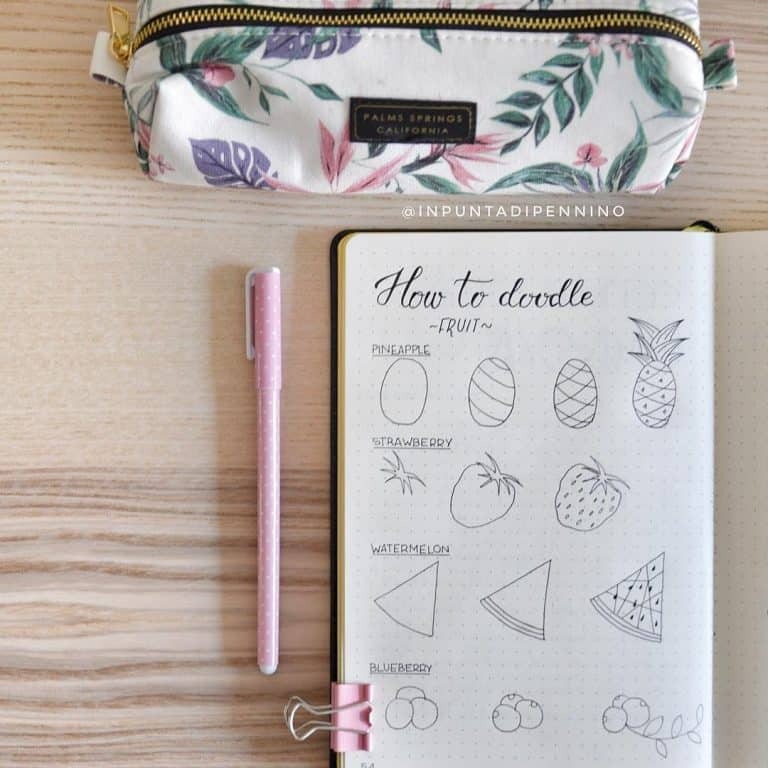 Yet, this proves that you don’t have to be an artist to create designs for your bullet journal. 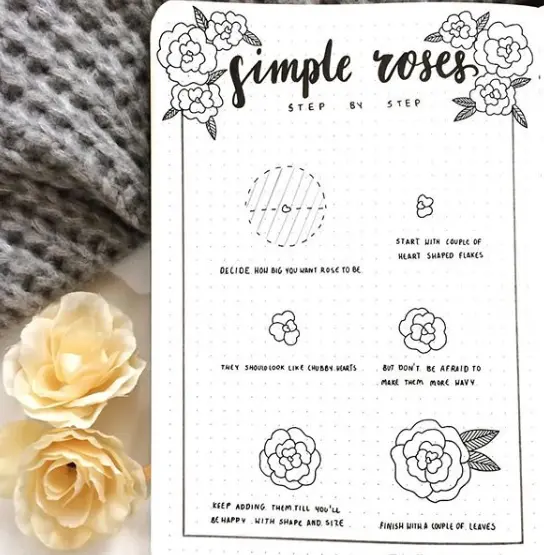 Simple doodles are already a great start to bring life to your BuJo and give you more enjoyment in bullet journaling. Just don’t be afraid to make mistakes because that is part of learning and experimenting. Loved this post? PIN it and let others know too! You’re welcome Leila! I’m glad you liked it!